Sure the pink, princess glitter costume is going to be a big hit for Halloween, but you’re not looking forward to spending the next few months cleaning glitter off of every surface. Here are some easy ways to clean glitter off fabric and furniture. To remove glitter from washable fabrics, all you need is a can of aerosol hairspray. Thoroughly spray the glittered area with hairspray and allow the hairspray to dry completely. Wash the clothing as you would normally, and the glitter should come off completely (without sticking to anything new). You may have to repeat the process twice if not all the glitter comes off on the first try. For removing glitter from furniture and other non-washable fabric, you have a few options. If you have a lint/pet hair remover in the house, they are also great at removing glitter. Use the sticky, rolling kind for optimal glitter removal. However you don’t need to run out of the house and buy a rolling lint remover, you can make your own by wrapping masking tape around your hand, sticky side out. Then just pat your hand over the glitter until it all comes up. You may have to change the tape a few times, but in the end you’re house will be glitter free. 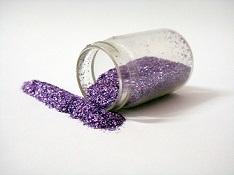 Make this Halloween stress free with this great way to clean up glitter.